Taylor County is one of the few places in Florida where you can harvest your own scallops. 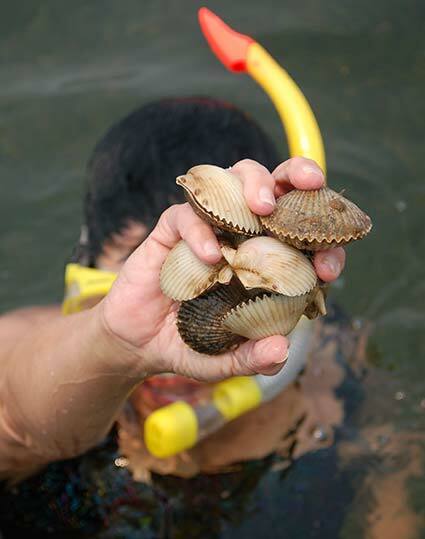 You'll find scalloping opportunities along our entire coastline, including Keaton Beach, Hagen's Cove and Steinhatchee. This unique activity is fun for the whole family and requires minimal resources to get started. It's relatively simple, and after spending an afternoon in the water searching out scallops, you can enjoy the fruits of your labor that evening for supper. Scallop season runs June 16 through September 10. Basically, the only materials you need for scalloping are a snorkel mask, fins (or water shoes) and a mesh bag to hold your catch. Once you're geared up, you'll need a boat to take you out, a diver's flag to snorkel in the water and a recreational saltwater fishing license to keep things legal (the license is relatively inexpensive and easy to acquire). Of course, not everyone answers the call of open waters. Those who aren't yet ready to test their sea legs should try their luck at Hagen's Cove, where you can join hundreds of other landlubbers wading into shallow waters in search of scallops. After you've pulled in your fair share (the limit is 2 gallons of whole scallops or 1 pint of meat per person; 10 gallons of whole scallops or 1/2 gallon of meat per boat), head back to shore to get them cleaned. Before you begin the task of cleaning your catch, be sure to get some instruction to help move things along. You might have thought it easy enough to get them out of the water, but it's not so simple getting scallops to come out of their shells. What you'll need: a place to set up shop (most marinas have ample facilities), a knife or other sharp flat object to open the shell, a spoon to scoop out the scallop and a container to hold the meat. Although it can take up to three hours to clean a boat's limit of scallops, most folks find that the time passes much faster with a little music, a few cool drinks and lots of good friends. Should you take the easy way out and miss all the excitement, there are usually a few locals hanging around the docks that will do your dirty work for you. They typically charge a small fee, usually $3.50 - $4.50/pint. Whatever means you choose, the outcome will be the same - a delicious meal of succulent scallops that you caught yourself.